Innovatum’s ROBAR Enterprise Label Management System for FDA-regulated Pharmaceutical, Medical Device, and Biotechnology manufacturers. Managing label design and production using disparate label design and printing tools, emailing label templates or relying on people to choose the right template from the right folder is expensive. Expense stems from inefficiency but more importantly, expense explodes when mistakes are made. 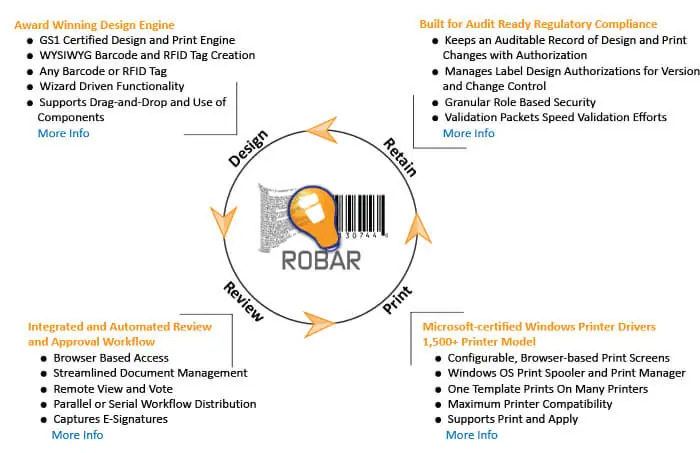 ROBAR enables central management of the entire label life cycle-from initial design and review to production use and eventual obsolescence. It seamlessly integrates labeling with any ERP, PLM or similar enterprise system, merging variable data with approved label templates at print time. Granular security ensures appropriate access and web based design allows use with contract manufacturers and or suppliers. Integrated and automated review and approval workflow together with mass editing and updates, whereby a single change is automatically applied to all relevant records and label templates, launching appropriate approval workflows, greatly differentiates ROBAR from any similar offering available. See it in action for yourself; request a demonstration or watch one of our product videos below.